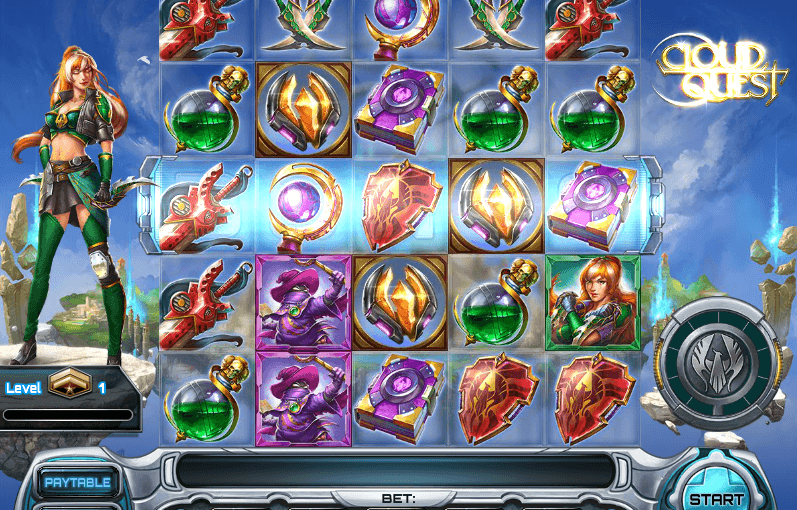 CloudQuest is a 5×5 reel video slot from Play’n GO. Connect three or more matching symbols along any diagonal,horizontal or vertical line to win. Symbols in winning combinations are cleared away, allowing any symbols remaining in the columns to fall into place and give you new chances to win. If you manage to clear all 25 symbols in the grid, the kingdom honours you with a special jackpot reward! A wild symbol replaces the middle symbol in every winning combination to give you a better chance of making more winning combinations. Certain wins may activate one or more sections of the Super Power wheel. If the circling light settles on an activated section of the wheel, you win a re-spin while endowed with a special power! No warrior can resist potent wilds, super scatters, or prizes worth five times the ordinary amount. Trigger the exciting bonus round to enjoy up to 20 bonus spins on a classic slot machine as you fight monsters on up to five different stages. Prizes for winning combos in the bonus round are multiplied by a factor equal to the stage you have achieved! Win a 100 times your bet for slaying the beasts on all five stages. You also win three times your total bet for any unused bonus spins once you emerge victorious.